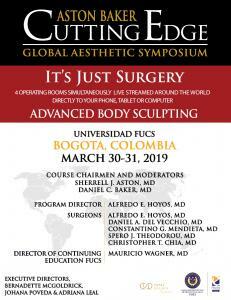 NEW YORK CITY, NEW YORK, USA, March 19, 2019 /EINPresswire.com/ — Internationally acclaimed plastic surgeons Dr. Sherrell J. Aston and Dr. Daniel C. Baker are proud to announce the first Aston Baker Cutting Edge Global Aesthetic Symposium, "It's Just Surgery – Advanced Body Sculpting", which will premiere this March 30 -31, 2019 from Bogota Colombia. 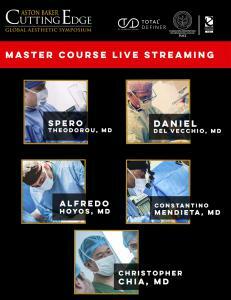 The program has been designed for high impact learning by direct visualization of live surgery via live stream technology on the internet. 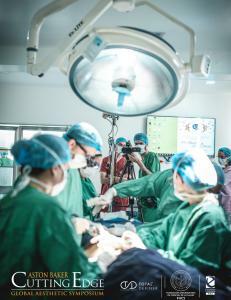 Live streaming provides the fastest method of information transfer with real-time observation of surgical operative cases and a LIVE explanation of steps, techniques and surgical reasoning. Earn CME credits in the comfort of your home, office or on the go while learning the latest advancements in Cutting Edge Body Contouring. This symposium is based on the same preeminent educational experience and state of the art plastic surgery innovation you have come to expect over the years from The Aston Baker Cutting Edge meeting in New York City. High-level curated content by Dr. Aston and Dr. Baker and a mix of U.S. and International surgeons operating live from four operating rooms will be simultaneously live streamed around the world, directly to your phone, tablet or computer. The Aston Baker Cutting Edge Global Aesthetic Symposium would like to recognize InMode, MicroAire, Motiva, Vaser and Wells Johnson for their generous support of plastic surgery education as Sponsors of the 2019 symposium. In particular, it allows the Cutting Edge Global Aesthetic Symposium to grant plastic surgery residents currently in training throughout the United States, free access to live surgical procedures with current thought leaders in a fully interactive and immersive experience. InMode, is an aesthetic medical technology company focused on developing products and procedures utilizing the most innovative radio frequency, light based energy and laser technologies. Their minimally invasive and non-invasive procedures are clinically proven to reduce treatment and recovery time and deliver real results, so people can live their most beautiful lives. For more information, please visit www.inmodemd.com. MicroAire Aesthetics, a world leader in aesthetic plastic surgery, produces the PAL® LipoSculptor™ (power-assisted lipoplasty); Endotine® bioabsorbable multi-point fixation devices for cosmetic facial procedures; and LipoFilter™ high-volume fat filtration and harvesting systems. MicroAire Aesthetics also makes EpiCut™ (epithelium tissue removal). For more information, please visit www.microaire.com. Motiva Implants® has been established as an innovative product with high levels of security, becoming a well trusted brand among high level plastic surgeons, both in the UK, the EU and globally. A revolutionary and dynamic system that will change the way round breast implants are perceived. Within the matrix, surgeons can easily select the ideal implant for each patient, while taking into account the individual aesthetic objectives. With the most comprehensive selection of 500 Motiva Implants® choices, surgeons will always have an ideal solution for the most discerning patients. For more information, please visit www.motivaimplants.com. VASERlipo® is precise ultrasound-assisted technology combining mechanical and acoustic fragmentation/emulsification of fat designed to maximize procedure speed and efficiency while minimizing trauma to surrounding tissue. For more information, please visit www.vaser.com. Since 1983, Wells Johnson has been the leading manufacturer of high quality body contouring equipment and instrumentation. Our most innovative product yet; The HVP™ (High Volume Precision) Auto-graft system, raises the bar for speed, control, efficiency and safety for large volume autologous tissue grafts/transfers. CHECK OUT THE ‘BOGOTA BUMP’at www.wellsgrp.com. Colombian Plastic Surgeon, Alfredo E. Hoyos, MD, will be acting as Program Director. Dr. Hoyos is the creator of High Deﬁnition Liposculpture and other advanced body contouring techniques, as well as the author of "High Deﬁnition Body Sculpting: Art and Advanced Lipoplasty Techniques".